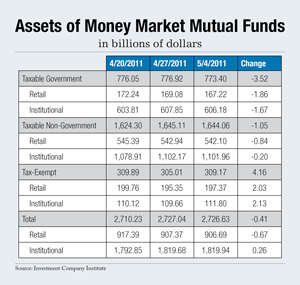 Total money market mutual fund assets decreased by $410 million to $2.727 trillion for the week ended Wednesday, May 4. Total money market mutual fund assets decreased by $410 million to $2.727 trillion for the week ended Wednesday, May 4, the Investment Company Institute reported . Taxable government funds decreased by $3.52 billion, taxable non-government funds decreased by $1.05 billion, and tax-exempt funds increased by $4.16 billion.